Home / Firearm Registry • Firearm Safety • Laws • Queensland • Queensland Police • Queensland Police Weapons Licencing Branch • Wedgetail 15-01 / Incompetence or Witness intimidation? Earlier today we were informed that a Qld based Collector has had his licenses suspended due to a sudden and treatable eye condition. Importantly, this man provided an affidavit to Applicants in the WT15-01 Pistol reviews currently before QCAT. that, amongst other things, identified WLB’s false image of the WT15-01 Pistol that WLB supplied to QCAT. As these Applicants included this affidavit in their material to QCAT for the reviews regarding the WT15-01 Pistol decisions by WLB, this man has become a witness for these Applicant’s reviews, and is therefore a QCAT witness. The man currently has a matter before QCAT regarding the conditions placed upon his license. He requested an adjournment on this matter several weeks ago as he suddenly developed a vision impairment that created issues with reading and dealing with glare. This condition was diagnosed by his optometrist and is expected to be resolved in due course after treatment. Given he is self represented as is the norm in QCAT it certainly seems prudent to us to ask for an adjournment of proceedings if you are struggling to read. To support his application for the adjournment this man supplied QCAT and WLB a copy of the optometrist report, and therefore, WLB were aware of this medical condition several weeks ago. 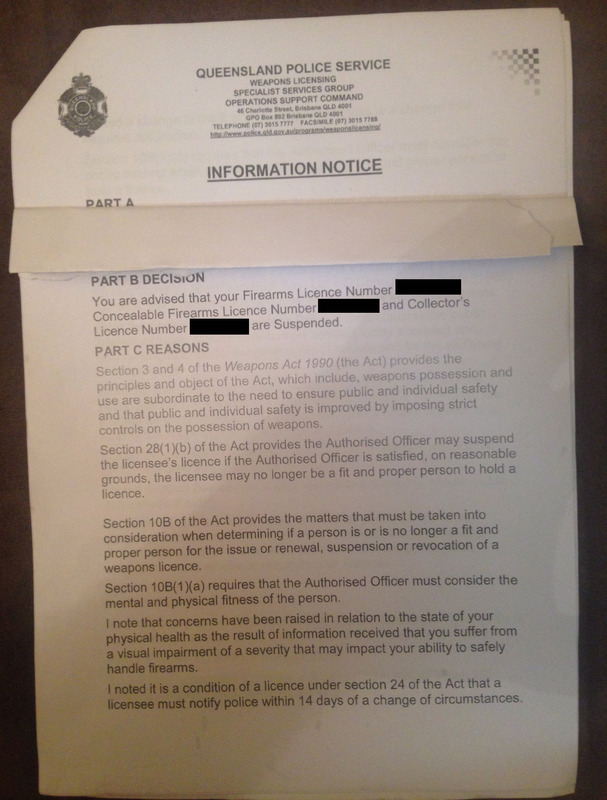 In response to this reasonable request Weapons Licensing Branch formed the view on 12 December 2018 when this man’s request for an adjournment was granted by QCAT, and, after he became a witness for the Applicant’s seeking a review of the WT15-01 decisions by WLB at QCAT that he was no longer a fit and proper person and decided to suspend his license. They suddenly appeared at his doorstep earlier this morning to serve him with a notice that he was required to immediately dispose of his firearms to his local police station. No requests for more information, no show cause notice, just a simple your license is suspended effective immediately. Had they bothered to ask for more information they would have found out that he is still capable of handling firearms in a safe and proficient manner, but has refrained from shooting until his eyesight is restored. Furthermore, it is difficult to conceive how impaired eyesight affects someone’s ability to hold permanently deactivated firearms under a collectors license. We can only wonder if this sort of action is the new direction in ‘gun control’ over at Weapons Licensing, or perhaps more troubling whether it is retaliation for his help in the Wedgetail case. Which would be a most concerning development as it would constitute interference with a witness, a serious criminal offence. Sadly given the timeline of when WLB became aware of this medical condition in comparison to when they became aware of his involvement with the WT15-01 matter the latter seems more likely. Either way it is highly concerning and this sort of ill informed action coming at a time when, with the new universal health record coming into effect, it seems entirely possible that Weapons Licensing Branch may well gain ready access to a plethora of medical information; information that they evidently lack the ability to comprehend. Keeping in mind that I am not a lawyer, in my opinion there is also a case for discrimination on the basis of a disability – his sight is impaired and suddenly he cannot have a licence that was previously granted? I’d certainly run that and the possible witness intimidation past a decent lawyer. Good observation. It certainly is!